Arabic dictionary improvements and working with MindMeister mindmapping online. We are updating ATbar all the time and working on new features such as the ability for the Text to Speech to read the Arabic dictionary if you want to highlight a definition and have it read back. We have also found that if you maximise a Mindmeister map by selecting the window in the map’s bottom toolbar – it opens a new window in the browser and you can launch ATbar to read the text on the mind map branches, add a tint overlay, use the dictionary etc. Try our new coloured overlay plugin that allows you to tint an entire web page – you can now read without glare choosing cream, pink, pale blue and pale green. All the buttons toggle the colours on and off. You can even click through and work with the links and write in forms is you are using the Chrome, FireFox or Safari browsers. Sadly Internet Explorer and Opera have yet to allow this feature to work. Thanks to Insipio we now have the options of male and female voices on both the Arabic and English ATbar and the time for the voice to come back to the user has been decreased. Hopefully all these additions will provide a better service. During the last month Magnus has taken over from Seb as lead developer on ATbar. Seb has sadly left us for the bright lights of iPhone app development but all seems to be going well in nearby Basingstoke! Magnus (who has been working on our web pages and the ATkt Market place) has tasked himself with sorting out our servers and organising all our work! The documentation is amazing. He has successfully returned the Word Prediction part of the ATbar to normal working and even shaken Internet Explorer into making correct changes so that none of the letters are being omitted and it appears to be replacing all the words both in Arabic and English correctly. But if bugs are found please report them to use via the contact form. The Arabic spell checker has an extended dictionary and is being tested for improvements as we develop a database to capture all the errors made and the corrections offered so that we can make further improvements. 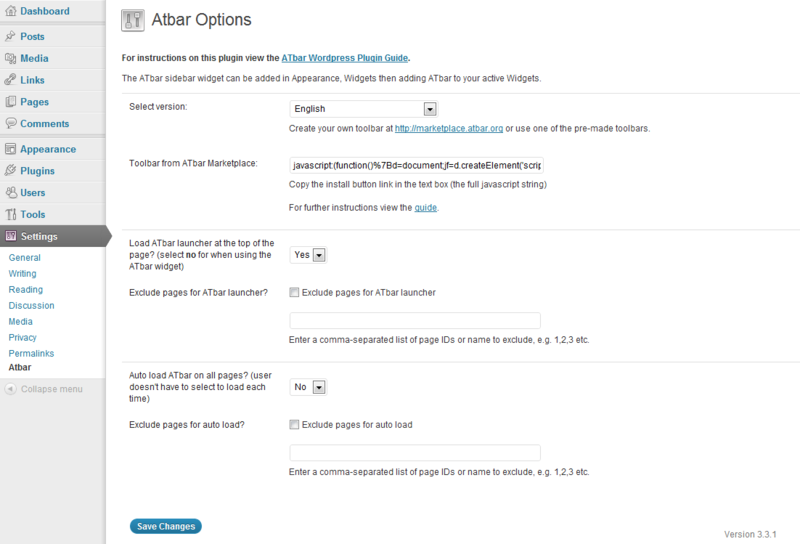 Magnus has just updated his ATbar WordPress plugin so it now supports English, Arabic and the Marketplace toolbars. 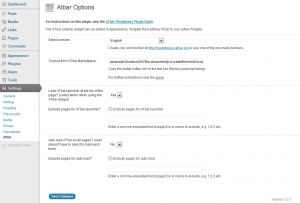 You just select the version you want and if it is a marketplace one, just paste the install link from the toolbar viewing page in the marketplace and it will load the toolbar just like the normal ATbar. It’s uploaded on the WordPress repository and Git Hub and it’s installed on our blogs and ATbar.org.